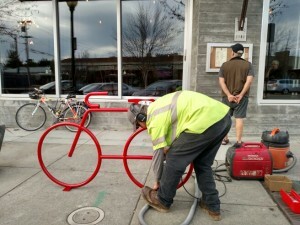 « More Bike Bike Racks coming, believe it or not! 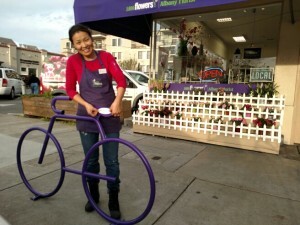 39 "Bike Bike Racks" now in Albany! Sandwiches, Boss, Cafe Eugene, Feagley Realtors, Little Star Pizza and Solano Smile – be sure to ride on by soon!! Thanks to your neighbors, fellow AS&R volunteers Dan Lieberman for helping mark/measure/photograph the locations over the years, Ken McCroskey for designing the fantastic customized decals at Design-a-Sign and Francesco Papalia for helping finesse some of the complicated locations. 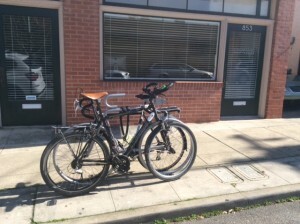 Diners at Cafe Eugene have plenty of bike parking now! AS&R’s association with the Albany Chamber of Commerce and the Solano Avenue Association has helped us find businesses who realize that their customers, clients, patients and staff want to bike there, and that it was worthwhile for them share the cost with AS&R and the City of Albany in order to provide attractive and secure bike parking. 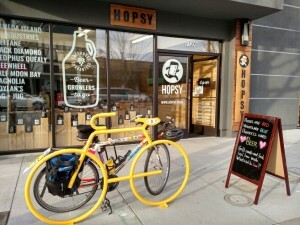 Pick up your Growler of Beer on your bike! the years in finding new bike-friendly businesses and has sent many a business owner my way A HUGE shout-out goes to Mark Matherly of Albany Public Works, who has installed all 39 of the Bike Bike Racks and whose attention to detail is greatly appreciated. Kudos also to Gale Rossi & Ray Chan of Public Works, who ensure that the racks get installed soon after they are delivered. 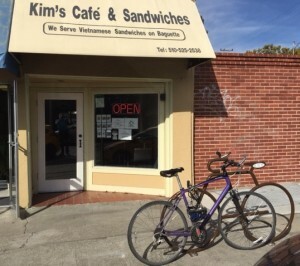 Without the generous annual donations of recreational cycling club Grizzly Peak Cyclists we would be hard pressed to have the funds to provide racks to every business that desires one. A special thanks also goes to Tom C. and Chris E., whose tax-deductible donations in 2015 were put immediately to use with this order. Tom and Chris, when you ride to any of these businesses and lock your bikes to these racks, you know that you were in part responsible! If any of you want to help with the next order, which is imminent, email Amy Smolens. Here is a full list of locations with AS&R’s “Bike Bike Racks” – more than 150 bike parking spots! Reading Center, Little Star Pizza, Prins Chiropractic, Metta Thai Massage/Be Fit Personal Training, Rising Sun Montessori Preschool, Royal Café, Solano Smile, T324, Tay Tah Café, St. Alban’s Episcopal Church, Zarri’s, City of Albany eastern welcome sign at Solano & Neilson . 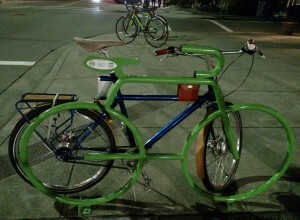 Ride to these businesses and tell them that you appreciate their attractive & practical Bike Bike Bike Racks!! Coming soon – racks at Fish First and Schmidt’s Pub. Any businesses that YOU know need one? Send them to me, Amy Smolens – thanks!